Animal vs Plant Protein – What’s the Difference? About 20% of the human body is made up of protein. Because your body doesn’t store protein, it’s important to get enough from your diet each day. You can get protein from many food sources, including plants and animals. Some people claim that the source of the protein, whether animal or plant, shouldn’t matter. Others suggest that plant protein is superior to animal protein. This article compares animal and plant proteins. When eaten, protein is broken down into amino acids. Proteins and amino acids are used for almost every metabolic process in the body. However, different proteins can vary greatly in the types of amino acids they contain. While animal proteins tend to contain a good balance of all the amino acids that we need, some plant proteins are low in certain amino acids. For example, some key plant proteins are often low in methionine, tryptophan, lycine and isoleucine. In total, there are around 20 amino acids that the human body uses to build proteins. These amino acids are classified as either essential or non-essential. Your body can produce non-essential amino acids. However, it cannot produce essential amino acids, which need to be obtained through your diet. For optimal health, your body needs all the essential amino acids in the right ratios. 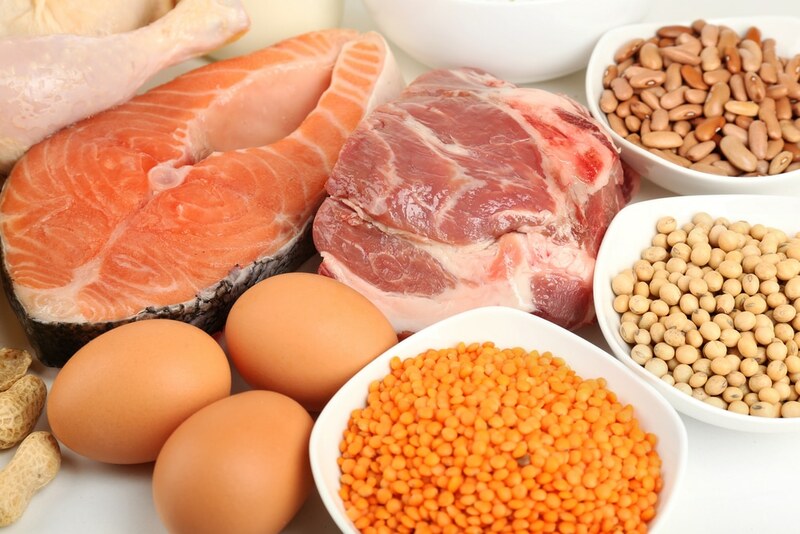 Animal protein sources, such as meat, fish, poultry, eggs and dairy, are similar to the protein found in your body. These are considered to be complete sources of protein because they contain all of the essential amino acids that your body needs to function effectively. On the contrary, plant protein sources, such as beans, lentils and nuts are considered to be incomplete, as they lack one or more of the essential amino acids that your body needs. Some sources report soy protein as complete. However, two essential amino acids are only found in small amounts in soy, so it isn’t comparable to animal protein . Of course, proteins are rarely found in isolation. They usually come with a wide variety of other nutrients. Foods that contain animal protein tend to be high in several nutrients that are often lacking in plant foods. DHA: Docosahexaenoic acid (DHA) is an essential omega-3 fat found in fatty fish. It’s important for brain health and is hard to get from plant sources . Red meat is a high-quality protein source. Several observational studies have linked red meat consumption to an increased risk of heart disease, stroke and early death. However, further research has suggested that the problem is not with all red meat, but rather with processed red meat. In a large observational study including 448,568 individuals, processed meat was linked to an increased risk of death, with no effect for unprocessed red meat. Another study involving over 34,000 women made similar observations. In this case, processed meat was associated with heart failure. Also, a large review of 20 studies found that processed meat was associated with an increased risk of heart disease and diabetes. Again, no association was found for unprocessed red meat. Additional studies have confirmed that unprocessed red meat consumption is not linked to heart disease. Despite this, one study found that replacing 1 serving per day of red meat with 1 serving of poultry was associated with a 27% lower risk of stroke. Diets high in plant protein, such as the vegetarian diet, are linked with many health benefits. Studies suggest vegetarians tend to have a lower body weight, lower cholesterol and lower blood pressure levels. They also have a lower risk of stroke, cancer and death from heart disease than non-vegetarians. A study found that a diet rich in protein (about half from plants) lowered blood pressure, cholesterol levels and the risk of heart disease more than a standard diet or a healthy high-carb diet. The EcoAtkins trial found that a low-carb, high-plant protein diet helped lower cholesterol and blood pressure more than a high-carb, low-fat diet. One small study of people with type 2 diabetes found that replacing 2 servings of red meat with legumes 3 days per week improved cholesterol and blood sugar. However, another small 6-week study of diabetics compared a diet high in plant protein with a diet high in animal protein. No differences were found in blood sugar, cholesterol and blood pressure. An observational study following 120,000 men and women over 20 years found that eating more nuts was linked to weight loss. Also, eating one serving of beans, chickpeas, lentils or peas per day can increase fullness and may lead to better weight management and weight loss. It’s important to remember that observational studies only report statistical associations. They cannot prove that these benefits were caused by eliminating meat or other animal protein sources. One thing to consider is that people on vegetarian diets tend to be more health-conscious than the general population. Therefore, the health benefits of vegetarian diets are likely due to overall healthier diets and lifestyles, rather than any inherent difference between plant and animal proteins. Animal protein is also associated with positive health effects, despite often being portrayed as unhealthy compared to plant protein. The Nurses’ Health study reported that poultry, fish and low-fat dairy were associated with a lower risk of heart disease. People who eat fish regularly are also likely to have a lower risk of heart attacks, strokes and death from heart disease. One study of more than 40,000 males found that those who regularly ate one or more servings of fish per week had a 15% lower risk of heart disease. Additionally, eating eggs has been linked to improved cholesterol levels and weight loss. In one study, women who ate eggs for breakfast, rather than a bagel, reported feeling fuller and ate less later in the day. Last but not least, eating animal protein is linked with increased lean muscle mass and a reduction in the muscle loss that occurs with age.